I put up the hummingbird feeder last week. I had to get a new feeder because the one I have, of this design, had broken. I'm getting a lot of traffic at the tube feeder. The last week has seen squirrels climb the crook and then feed, upside down, from the tube. That is not a positive, but there is an inexpensive way to stop that. The next time I fill the feeder, I need to dump in with the seed, half a container of cayenne pepper. It has no effect on the birds, but the squirrels? Oh yeah. They will quickly learn this feed is not for them. I've had chickadees and a couple finches at the north window feeder. Goldfinches and chickadees have also discovered the feeder here on the east window. I have mourning doves and rabbits eating the seed flung out to the ground so I've been sprinkling seed on the ground specifically for them. The squirrels love it too, but they don't seem to be cleaning everything up which is good for ground feeding birds. I have to decide what, if anything, I'm going to do for them in the winter. This morning, I saw a female hummingbird flitting amongst the flowers of the hosta in the back. This year, they bloomed profusely, more than I have seen in a long time. Not sure why that is, but it's lovely. My hope is now that the hummingbird will find the nectar in the front. Some of it is gone in the week intervening, since I set this up. I don't know if that can be attributed to evaporation or if birds are feeding when I'm not watching. I'm happy with this. The last step is to right the birdbath I purchased and get that weighted so I can fill it. I need to do some weeding. That's always the case, but this has turned out nice. 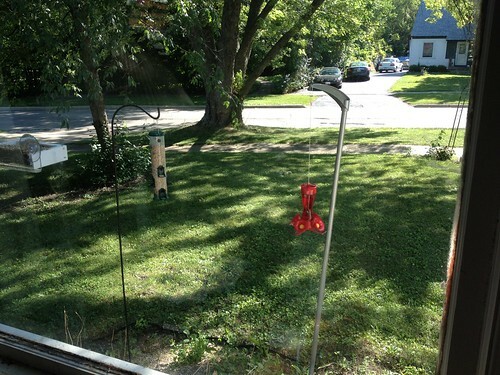 I am thinking I may get a suet feeder to replace the hummer feeder come November.